This question has been asked by humans for countless cent here was no answer until electricity and magnetism were to the single discipline of electromagnetism, as described by Mu-treJ!’ equations. These equations show that a time-varying mag field acts as a source of electric field and that a time-varying electric acts as a source of magnetic field. These if and jj fields can sustain other, forming an electromagnetic wave that propagates through .Visible light emitted by the glowing filament of a light bulb is one of an electromagnetic wave; other kinds of electromagnetic are produced by sources such as TV and radio stations, microwave rs for ovens and radar, x-ray machines, and radioactive nuclei. In this chapter we’ll use Maxwell’s equations as the theoretical basis for understanding electromagnetic waves. We’ll find that these waves both energy and momentum. In sinusoidal electromagnetic waves, the if and jj fields are sinusoidal functions of time and position, with a definite frequency and wavelength. 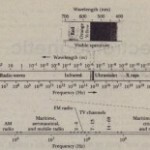 The various types of electromagnetic waves-visible light, radio, x rays, and others-differ only in their frequency and wavelength. Our study of optics in the following chapters will be based in part on the electromagnetic nature of light. Unlike waves on a string or sound waves in a fluid, electromagnetic waves do not require a material medium; the light that you see coming from the stars at night has traveled without difficulty across tens or hundreds of light years of (nearly) empty space. Nonetheless, electromagnetic waves and mechanical waves have much in common and are described in much the same language. Before reading further in this chapter, you should review the properties of mechanical waves as discussed in Chapters 19 and 20.